After early breakfast, transfer to Airport for domestic flight to Heho. On arrival, drive to Pindaya, which takes approx. one and a half hour. Visit Pindaya caves, unique for thousands of Buddha images placed there by pilgrims over many centuries. 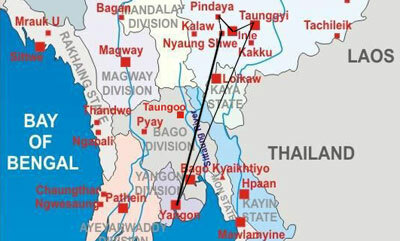 Transfer to Nyaung Shwe, near by the Inlay lake. Dinner and overnight in Nyaung Shwe. After breakfast, start sightseeing tour in Inle lake by boat. Included in the tour program are; local way of fishing, Phaung Daw Oo Pagoda, the most revered one on the lake, and the Nga Phe Chaung Monastery well known for its Jumping Cats. Lunch on the lake. After lunch, return trip to Nyaung Shwe. Continue to Taunggyi the capital city of Shan State by motor-road. Sightseeing in Taunggyi. Dinner and overnight in Taunggyi. After breakfast, transfer back to Heho Airport for return flight to Yangon. Visit to Shwedagon Pagoda, the landmark of Yangon and one of the world's most spectacular religious monuments. It is said to be built over 2000 years ago enshrining the hair relics of Buddha. Continue to Chauk Htat Gyi, to see the huge reclining Buddha Image and then to gilded Sule Pagoda, over 2000 years old, and still stands as the land mark of Yangon City Center. Proceed to Bogyoke (Scott) Market where hundreds of stalls of souvenirs and handicraft shops can be visited.